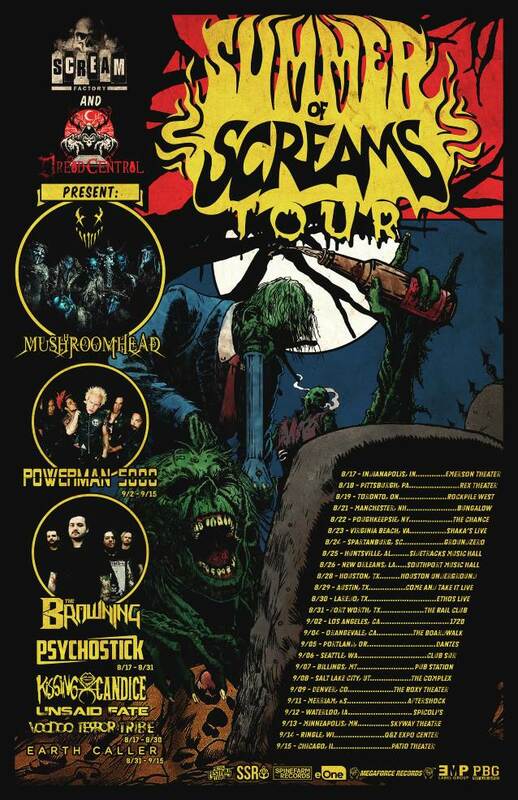 MUSHROOMHEAD, one of metal's most unique and adventurous bands, will headline the inaugural edition of the "Summer Of Screams Tour" presented by Scream Factory and Dread Central. Joining MUSHROOMHEAD on the tour will be POWERMAN 5000 (on select dates), THE BROWNING, PSYCHOSTICK (on select dates), KISSING CANDICE, UNSAID FATE, VOODOO TERROR TRIBE (on select dates), and EARTH CALLER (on select dates). The "Summer Of Screams Tour" will run for 25 shows across North America, beginning on August 17 and running until September 15. Tickets are set to go on sale Wednesday, June 6 at 12 p.m. ET / 9 a.m. PT. MUSHROOMHEAD's March 17 concert at Music Lynxx in Mentor-on-the-Lake, Ohio marked the band's first appearance with new vocalist Steve Rauckhorst (bassist of PITCH BLACK FORECAST) and guitarist Tommy "Tankx" Shaffner (also of VENTANA). Church made his recording debut with MUSHROOMHEAD on the band's eighth studio album, "The Righteous & The Butterfly", which was released in May 2014 via Megaforce Records. Church's exit from MUSHROOMHEAD came only a day after co-vocalist Jeffrey Nothing, also known as Jeff Hatrix (born Jeffrey Lewis Hetrick), said he was leaving the Cleveland, Ohio metal band he co-founded in 1993 with Steve "Skinny" Felton. 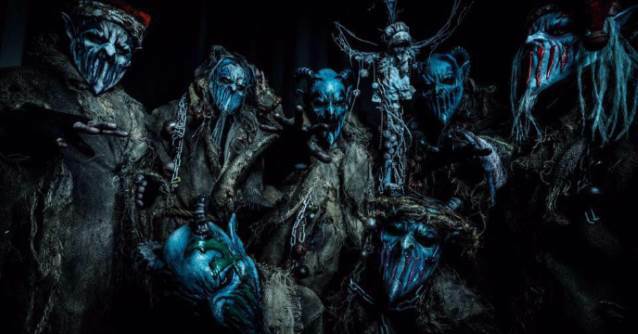 MUSHROOMHEAD turntablist Richard "Stitch" Thomas said about the band's most recent lineup change: "I know a lot of you are angry and confused on the latest news, but this is not news to us. We were made aware that Jeff and Church were leaving and a plan was in motion to make a proper transition. They both decided to let the cat out of the bag on Facebook before a proper press release was made. This was not part of the plan discussed. "If I learned anything, it's that MUSHROOMHEAD lives on no matter what and that is what we are doing right now. "The replacements for both members have been in place for quite awile, the new singer was even endorsed by Mr. Nothing. "Both of these gentlemen are longtime friends of mine, they are talented musicians and have been in the mosh pits at MUSHROOMHEAD concerts since 1996. They are huge fans of the band and are going to breathe new life into MUSHROOMHEAD, carrying on its legacy into the next chapter. I'm very excited to be sharing the stage with them moving into the future."